Exclusive online offer of flat fee wrapping! 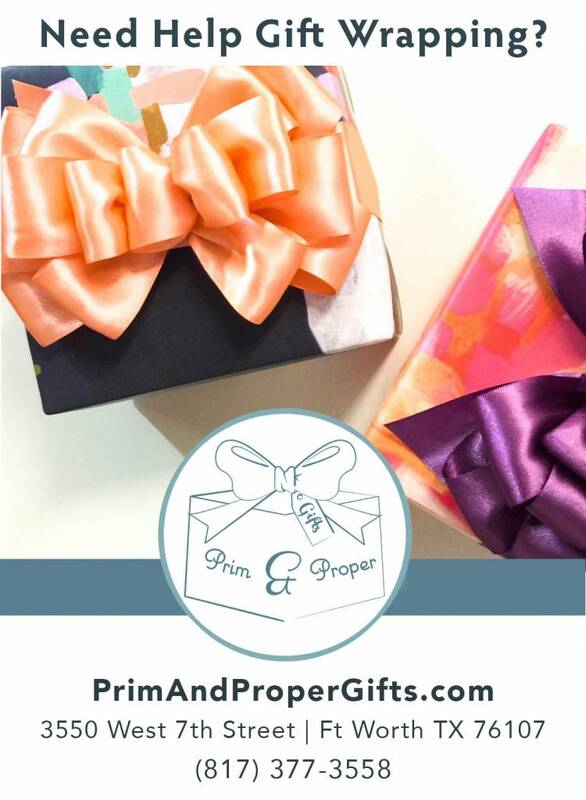 Prim & Proper Gifts offers a gift wrapping service in Fort Worth, Texas. I want to extend this service to my online customers (even if you happen to live in the area and schedule the gift for pick up) Any product purchased online will be entitled to flat fee for wrapping ($12.95). And we're not talking your big chain store type of wrapping. We want it to match the occassion and/or try to meet any special requests you might have. So let us know if it's a birthday for her, a wedding for them, something for him, a shower for mom to be, etc. As always, we are here to help you gift properly.